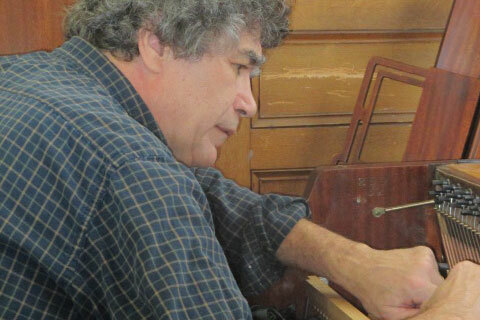 Don Dalton of Smokeshire Piano Service has completed the much-needed repair of Whiting Library's piano. The Library is extremely grateful for this generous service to the community. The 1950's era Story and Clark upright was donated over 15 years ago and has languished on the lower floor. When Don volunteered his service, the piano was moved to the main floor in more favorable heat and light where he began a thorough assessment of its needs. "When I first sat down to the piano, I noticed the action was very heavy - the keys were hard to play, and some notes were sticking, so I pulled the action out and took it to my shop." The action was completely repaired so the hammers could swing freely, striking the strings as they should and returning correctly. When the action was repaired and reinstalled, Don began tuning using an electronic tuner. He says, "although purists scoff at this, the truth is that even a lot of old-timers have switched to this method, which makes tuning tasks easier." He then tuned unisons by ear (each note in the center and treble of the piano has three strings all "united" at the same pitch), which is an art in itself. Don Dalton began thinking about piano tuning in 2017 because he was having trouble finding someone to tune his grand piano. He began formal training as a piano technician first at the highly-regarded Randy Potter School of Piano Technology, switching his studies to the Piano Technicians Academy. He has taken courses in vertical piano regulation, grand piano regulation, and piano voicing from Jim Busby, Master Piano Technician. In 2018 he traveled to Kansas City, Kansas, to participate in the three-day workshop on grand piano regulation at the Piano Technicians Guild headquarters. Don is an Associate Member of the Piano Technicians Guild.